I haven’t done this in a while and it’s because I haven’t really purchased anything lately. I hate going shopping now because when trying on clothes I end up feeling a bit blue. I know it’s normal to gain weight as it’s part of pregnancy and I accept that. I just hate spending the money to buy clothes knowing that I’m going to wear them for 3 more months. WHO AM I?!? I love shopping. I love putting outfits together. I’m really trying to force myself to shop my closet for this pregnancy. Which means a lot of leggings, jersey dresses, and cotton tees and tanks. I keep purchasing tops for my ever expanding belly, but what really I need is a good pair of maternity jeans. I’ve heard such great things about J Brand Maternity Jeans and I’m really tempted to buy a pair, but at $200 for the next 3 1/2 months, I don’t know about all that. Let’s get on with my January and February favorites. Cruising. Caribbean weather. Nothing like cruising through the Caribbean during the winter season when it’s cold and instead of freezing your bum off you’re basking in the sun on a beach in the Carribean. LOVE IT! Plus all the food on the cruise and just being on vacation with loved ones is GREAT! Touch encounter with a dolphin. 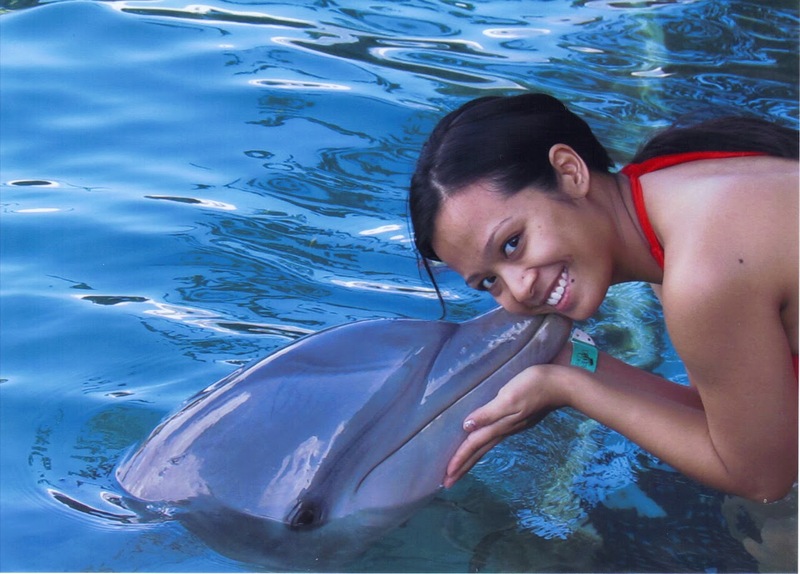 I wasn’t allowed to swim with the dolphins when we were in Jamaica because I was pregnant, so I was limited to standing in knee deep water and touch/kiss the dolphin. I later learned from the hubs and sister in law that if I were to swim with the dolphin, they’d hear the baby’s heartbeat via sonar. I don’t know if that’s a good thing or bad thing. Not sure if the dolphin would freak out. But regardless it was cool to do. Definitely going to swim with the dolphins next time. Our Baby Announcement. We waited a while to tell EVERYONE about our news so that we could put together our baby announcement video. Starbucks App for Android or iPhone. My sister introduced this to me and the hubs while at home during Christmas. Rewards and paperless/plastic less payments! Who wouldn’t love it. Google Wallet. I can use this anywhere where they take MasterCard touch pass. Completely paperless/plastic again but exclusive to my Galaxy Nexus. LOVE a Google Phone’s capability. Bubble baths using Lush bath bombs. I’m more of a shower person, but one day I decided to walk into Lush and purchased a couple bath bombs to see what they were about. Decided to take a bubble bath and try it out when I was feeling a bit stressed one day and now I’m hooked. Some candles, spa or slow jams channel on Pandora and one of these bath bombs and I’m in a state of total relaxation. And when I get out my skin is silky smooth! All good things to indulge in when pregnant. What were your favorites January and February items? Any suggestions for a pregnant woman to indulge in? Any apps that you’re loving?